The Bear Trap Door opened on December 19,when Federal Reserve Chairman Jay Powell said: "The balance sheet is on auto pilot, we don't see balance sheet runoff as creating problems." The S&P 500 Index had pulled back to the long-term trendline and could have gone either way as many expected dovish comments would support an advance. Instead his comments triggered a bear market. Despite Powell's attempt to soothe the markets Friday, it will now take extraordinary positive developments to renew the uptrend that began in March 2009. S&P 500 Index charts follow in the market review along with a mark-to-market update for SPDR S&P 500 ETF (SPY) put spread suggested in Digest Issue 49 "Technical Damage [Charts]." S&P 500 Index (SPX) 2531.94 gained 46.20 points or +1.86 % last week after making a new low at 2346.58 on December 26 then reversing to make a wide range reversal and advancing 116.60 points. Friday it recovered 84.05 points on Powell's latest conciliatory comments after losing 62.14 the day before. Should the rebound continue considerable resistance can be expected between 2550 and 2600 as it moves up toward the broken upward sloping trendline shown in the charts below. CBOE Volatility Index® (VIX) 21.38 declined 6.96 points or -24.56% last week after peaking at 36.20 on December 26 as the S&P 500 Index made a new low before reversing. Since early October the upward sloping 50-day Moving Average has done a god job containing pullbacks and Friday's close ended just below. Any further decline would support the view that the S&P 500 Index will attempt to test resistance between 2550 and 2600. Our similar IVolatility Implied Volatility Index Mean, IVXM using four at-the-money options for each expiration period along with our proprietary technique that includes the delta and vega of each option, declined 5.88 points or -23.57% last week ending at 19.07. 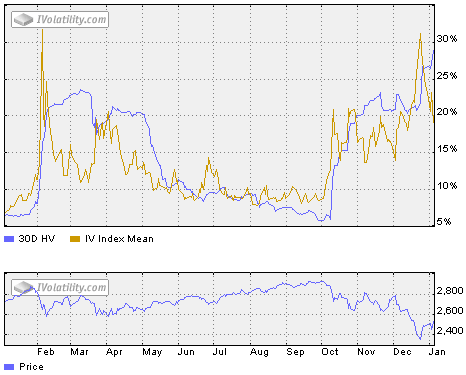 The one-year volatility chart shows a recent spike up above 30, comparable to the spike last February suggesting a capitulation bottom was likely made on December 26. With 7 trading days until January expiration, the day-weighted premium between January and February allocated 35% to January and 65% to February for a .77% premium vs. -13.90% the prior week ending December 28. Still below the bottom of the green zone between 10% to 20% but improved. This chart updates the long-term upward sloping channel from the March 2009 bottom and includes the first four Elliott Wave counts as of June 2017 along with the 5th wave marked in red at the arrow, since the trendline from October 4, 2011 at 1074.77 (2) to February 11, 2016 at 1810.10 (4) was broken on December 19, 2018. This close up shows the trendline from February 11, 2016 at 1810.10 and the close below the upward sloping trendline, USTL on December 19, 2018 ending the long uptrend from a trendline perspective. Based upon many previous examples it should now attempt to retrace the decline and test the trendline that will act as resistance around 2550 to 2600. Should it fail at the resistance and turn lower , the bear market will be further confirmed. In order for the long-term uptrend to resume it will need to overcome the resistance and advance to a new high above the September 2018 high of 2940.91 at the 5 in the top chart. According to the trendline the bear market began December 19, 2018 thanks to Jay Autopilot Powell 's comments. Nimble traders might consider reducing hedges and collars until it the S&P 500 Index tests resistance between 2550 and 2600 where it will likely experience considerable selling pressure by those convinced the bear has more downside to go. Others may just wait to see. Opening the Bear Trap Door is like trying to put a genie back in the bottle. Once the S&P 500 Index fell through the long-term upward sloping trendline it will take considerable positive fundamental news to change investor sentiment and technical analysis models enough for it to climb back through selling resistance and reach another new high. Is it possible? Sure, it did so in 2016, but the fundamental circumstances were arguably more favorable then than now. For now and until proven otherwise, the S&P 500 Index is in a bear market hole so the modus operandi of buying the dips has been replaced by selling the rallies. The last remaining bulls were taken to the livestock auction on December 19, 2018 and sold. For the record here is a mark-to-market update for the SPDR S&P 500 ETF (SPY) long put spread suggestion in Digest Issue 49 "Technical Damage [Charts]." SPDR S&P 500 ETF (SPY) 252.39 gained 4.64 points or +1.87% for the week including +8.18 points Friday. et. Nimble trades may want to consider closing this and similar positions. Then if the SPY turns lower again between 255 and 260 as expected, consider another March put spread. 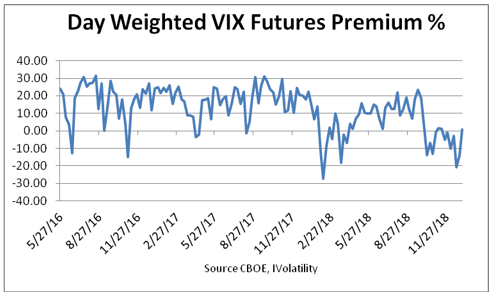 While the S&P 500 Index bounced off the December 26 low and the VIX turned lower while the VIX futures premium turned slightly positive, all suggest the current bounce will likely continue up to resistance between 2550 and 2600 where it will likely encounter considerable selling from traders and strategists who now consider the S&P 500 Index to be in bear market territory. Since 4Q earnings reports will soon start, next week will be devoted to our Volatility Kings™ list.